November 25, 2018 6:40 pm. Almond Eye wins the 2018 Japan Cup in a record time. 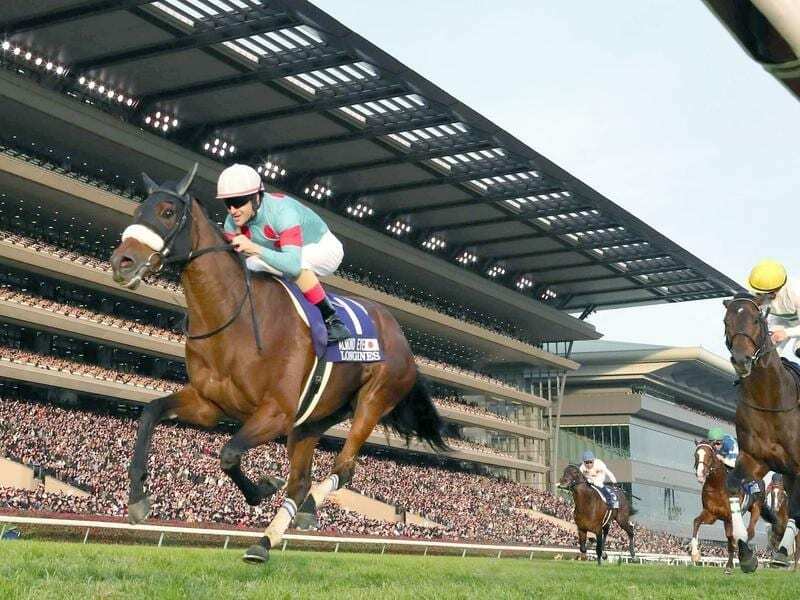 This year’s triple crown winner and heavily favored Almond Eye became the second three-year-old filly after Gentildonna in 2012 to dominate the Japan Cup. The remarkable starlet prevailed in front of the nearly 100,000 crowd under jockey Christophe Lemaire by a record-breaking 2:20.6, 1.5 seconds faster than the previous record set by Alkaased in 2005. After marking a second in her debut start, the Lord Kanaloa filly has been undefeated since, landing six consecutive victories including the fillies’ Triple Crown—Oka Sho (Japanese 1000 Guineas, G1), Yushun Himba (Japanese Oaks, G1) and the Shuka Sho (G1). This is the first Japan Cup triumph and 15th JRA-G1 victory for trainer Sakae Kunieda while jockey Christophe Lemaire celebrates his second Japan Cup win—his first was with Vodka in 2009. Lemaire now owns 22 JRA-G1 trophies and renewed his own record of eight G1 titles won in the same year. The highly targeted heavy favorite Almond Eye broke from the inner-most stall, hugged the rails a few lengths from the frontrunner in second, steadily climbed the stretch hill and swooped past Kiseki at the furlong pole, pulling away easily to a 1-3/4-length victory. Breaking from stall eight, four-year-old Kiseki was rushed to the front before the initial turn, set the pace and extended his lead up to three lengths in the backstretch, kicked into gear in the homestretch but proved no match for the winner while driving home well holding off Suave Richard by 3-1/2 lengths for second. Second favorite Suave Richard was quickly steered to the rails from a wide stall, was a bit keen in the backstretch traveling in fifth behind Almond Eye, chased the leaders in the straight and gradually ran out of steam but withstood the hard-charging Cheval Grand to secure third by a neck. A bit fractious in the paddock, seventh favorite Thundering Blue broke from stall six, was unhurried as usual in the far rear of the field, entered the stretch last, made a tenacious effort but was unable to reach contention and passed his tiring rivals to finish 10th. “I thought the ground was too quick and he was a bit too tense before the race in the paddock. He did show his brilliance in the final stages, but it was a good experience and he will now be given a good rest and we’ll see how he does next season,” commented trainer David Menuisier after the race. “The horse lost his concentration because of the loud crowd. He stretched well in the end but the horses in front were just too fast,” said jockey Francis Berry. Sent off sixth favorite, the Aidan O’Brien-trained Capri was off slow, cruised third from the rear, showed a moderate turn of foot in early stretch but failed to reach contention behind the rapid pace and was 11th. “The ground was quick and the pace too fast. The winner finishing at 2:20.6 was too good,” commented jockey Ryan Moore.